Calvin C. Clark, 94, of Lynchburg, passed away Saturday, Feb. 9, 2019 at Clinton Memorial Hospital. He was born Feb. 25, 1924 in Dayton, the son of the late Sherman T. and Nora (Strowbridge) Clark. He was a life member of the Hillsboro VFW Post 9094 and Lynchburg Lodge 78 F. and A.M., as well as the Scottish Rite Valley of Cincinnati. 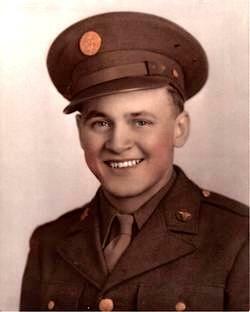 He was a proud World War II veteran of the United States Army. Calvin is survived by two children, Gary Clark and Gail (Rick) Daulton, both of Lynchburg; four grandchildren, Christine Clark Anderson of Lynchburg, Angela (Butch) Burrier of Hillsboro, Daniel McKinney of Wilmington and John Daulton of Texas; eight great-grandchildren, Ryan (Patsy) Honeycutt of Hillsboro, Cory Cloud, Justin (Abby) Clark and Blake Anderson, all of Lynchburg, Brady McKinney of Wilmington, and Gabriel Daulton, Grace Daulton and Hadley Daulton, all of Texas; six great-great-grandchildren, Adelyn Clark, Alexandra Clark, Myla Honeycutt, Brayden Honeycutt, Cameron Honeycutt and Bryson Cloud; many nieces and nephews; special friend, Pam Hertenstein Scott of Lynchburg; as well as the children and family of Calvin’s long-time companion, Della Wilson, who passed away in 2012. In addition to his parents, he was preceded in death by his wife, Maxine Clark, on Sept. 4, 1985; as well as 13 siblings. Services will be 2 p.m. Thursday, Feb. 14 at the Davis-Turner Funeral Home in Lynchburg. Visitation will be noon-2 p.m. Masonic services will immediately precede the funeral service. Burial with military honors presented by the Highland County Honor Guard will follow at the Lynchburg Masonic Cemetery. To leave an online condolence to the family, please visit www.turnerfuneralhomes.cc.